Summary：This is a list of 2016 top 5 best video player for Mac with suggested Mac/Apple TV remote control app on iPhone for the use of best Mac media player, if you plan to buy or have got a Mac, MacBook Air, MacBook Pro, etc. For those who are passionate about watching movies or videos you should need a powerful video player. If you are Mac owner, Mac has the problem of being lack of support for video players. If you'd like to have a best Mac video player for your video needs, like fluid playback of all video file formats, support of SRT file, etc, on a Mac computer or laptop which might be connected with HDMI to your Apple TV, you've come to the right place. Here we go. VLC Media Player comes first on our list. VLC is an absolutely free open-source software for watching movies, other kinds of videos. VLC is much popular because its ease of use and simple interface. VLC is compatible with Mac OS X, Windows, Linux, Android, iOS, etc. You can download latest VLC for Mac OS X 10.6 and later from VLC’s official site. You can also download previous versions of VLC for legacy versions of Mac OS X.
QuickTime Player, developed by Apple, is the default video player on any Mac OS system and apparently a good free option for Mac users. This best media player for Mac supports most common video audio and image formats, works great with HD videos, and enables you to record, edit and stream Internet videos and HD movie trailers. One exception is that Mac QuickTime video player does not support WMV and DivX. Note: Be advised that OS upgrade may lead to your QuickTime player crashing on Mac sometimes. Be sure to research pros and cons of your Mac OS upgrading move, check out if your computer is better enough to run QT and prepare for Mac video player issues in advance. Free media player, which supports playback of almost any video or audio files. It offers numerous options to enhance viewing experience: 10-band audio Equalizer, video tuner to change brightness, saturation, contrast, etc., changing video aspect ratio, fitting image to screen, etc. Handy URL option enables accessing YouTube videos from the app directly without opening a web browser with its noisy ads. Many Mac users take MPlayerX media player as a standard part of their toolbox simply because it works properly and all most popular codecs are in it. No fuss or headache of codec installing or updating. Seriously, you will not be frustrated with such practical video player on your Mac OS. Problem like disappearing of title bar in QuickTime never happens. When playing AVI file on Mac/MacBook, this best Mac media player performs great without stuttering while Divx player cannot recognize the file sometimes. Well, system crash things happen randomly, which should be tackled properly. DivX player for Mac is a powerful movie video player for Mac especially for HD videos playback, such as all native DivX videos, MKV and HEVC up to 4K movies. QuickTime files are included as well. 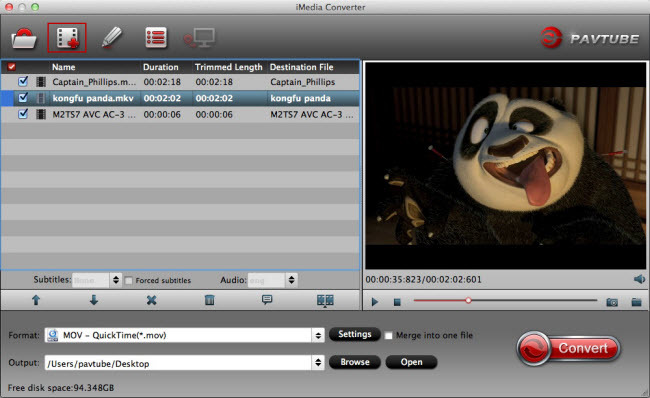 With an easy-to-use interface, DivX player also plays as a video converter. But, this Mac video player seems to eat up too much space with its big installation file. So enough space matters to it. All of them are powerful video players for Mac. You can choose anyone based on your own needs. If you want to playing MOV, AVI, MP4, FLV, MKV, 3GP, MP3, FLAC Video/Auido files on MacBook/MacBook Air/MacBook Pro/iMac/5K Retina iMac With Mac OS X El Capitan? You may need to the below tips.